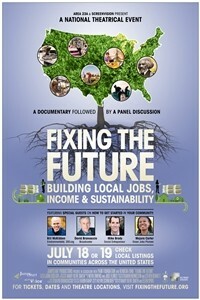 Fixing the Future: A Special Theatrical Event | Style Weekly - Richmond, VA local news, arts, and events. In Fixing the Future, host David Brancaccio, of public radio's Marketplace and NOW on PBS, visits people and organizations across America that are attempting a revolution: the reinvention of the American economy. By featuring communities using sustainable and innovative approaches to create jobs and build prosperity, Fixing the Future inspires hope and renewal in a people overwhelmed by economic collapse. The film highlights effective, local practices such as: local business alliances, community banking, time banking/hour exchange, worker cooperatives and local currencies. Following the documentary on the night of July 18, 2012, audiences will enjoy an exclusive onscreen discussion panel featuring luminaries Bill McKibben, Majora Carter, Mike Brady and David Brancaccio. Event hosts will have the opportunity to submit questions for our panelists.